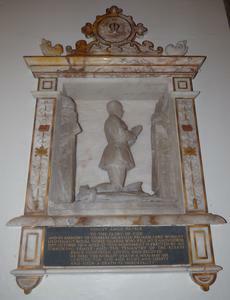 A wall-mounted marble sculpture depicting Lieutenant Charles Sackville Pelham in profile, kneeling to pray inside a trench. He is bareheaded and at his feet are his sword and hat. 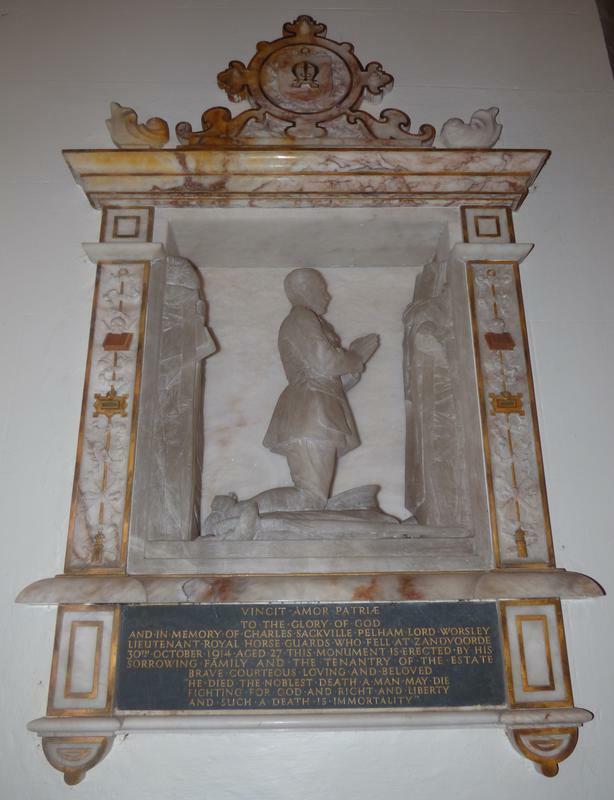 This scene is set in a highly decorative frame, with a slate panel below bearing the inscription. An elaborate family crest mounted on the top of the frame. VINCIT.AMOR.PATRIAE/ TO THE GLORY OF GOD/ AND IN MEMORY OF CHARLES SACKVILLE PELHAM LORD WORSLEY/ LIEUTENANT ROYAL HORSE GUARDS WHO FELL AT ZANDVOORDE/ 30TH OCTOBER 1914 AGED 27 THIS MONUMENT IS ERECTED BY HIS/ SORROWING FAMILY AND THE TENANTRY OF THE ESTATE/ BRAVE COURTEOUS LOVING AND BELOVED/ "HE DIED THE NOBLEST DEATH A MAN MAY DIE/ FIGHTING FOR GOD AND RIGHT AND LIBERTY/ AND SUCH A DEATH IS IMMORTALITY"
Information shown: Surname, forename, rank, regiment, date of death, place of death, age at death, relationships.